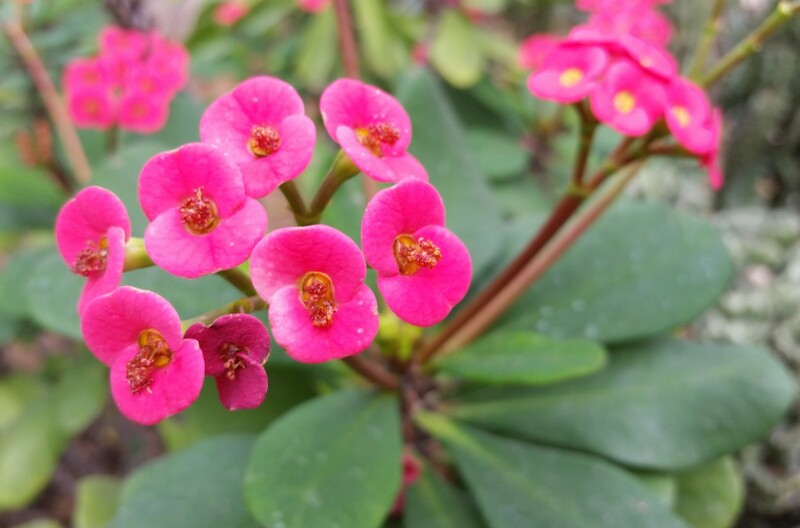 Euphorbia milii is a very easy plant to grow, that thrives on neglect and puts out a colorful display of bracts around the unnoticeable flowers. The crown of thorns, generally blooms heavy in the winter and intermittently throughout the year. However when you have a large specimen plant it’s more or less a continuous bloomer. Interestingly enough light during the night time can disrupt the flowering cycle of this plant according to Tropica Nursery. Crown of Thorns sap is poisonous and can be a skin irritant so be careful when trimming or reporting the plant. If you are making cuttings you can use cold water to stop the oosing of the sap from both the plant and the cutting. There are variety of hybrids available with colors ranging from red , orange, yellow all the the way to white. The bracts can be stripes even dotted. There are dwarf varieties and variegated ones as well. Flowering depends on the hybrid type, not all are prolific bloomers. This plant can thrive on neglect. It can tolerate dry soil pretty well. Overall it has lower to medium watering requirements. Don’t let the soil be soggy, as your plant will most likely rot. Some of the hybrids however prefer a bit more frequent watering than your tipical succulent plant. The higher the better. This plant will grow well on east/west and south facing windows. Euphorbia milii is very tolerant of dry environments and is not needy in any way. It’s pretty much indifferent to the humidity level as you can just as well grow it next to higher humidity plant. Cactus soil and cactus fertilizer work just fine for Euphorbia milii. You can use a regular fertilizer as well, at low dilution. Be careful during reporting time, I would recommend using gloves or wrapping the plant in newspaper to help with handling it. Can be propagated though cuttings very easily. As with most succulents, it helps to leave the cutting out a few days to dry out a bit before planting it in moist sand to root. Rooting hormone can be used to speed up the process. The plant tolerates well being re-potted lower than the original level it was in its old pot. Euphorbia milli can get leggy and the higher the light, the better the plant growth and flowering habit. Most hybrids available are very easy to flower, are free branching and have a bushy growth habit in general. If the plant grows leggy don’t feel bad for cutting it back. 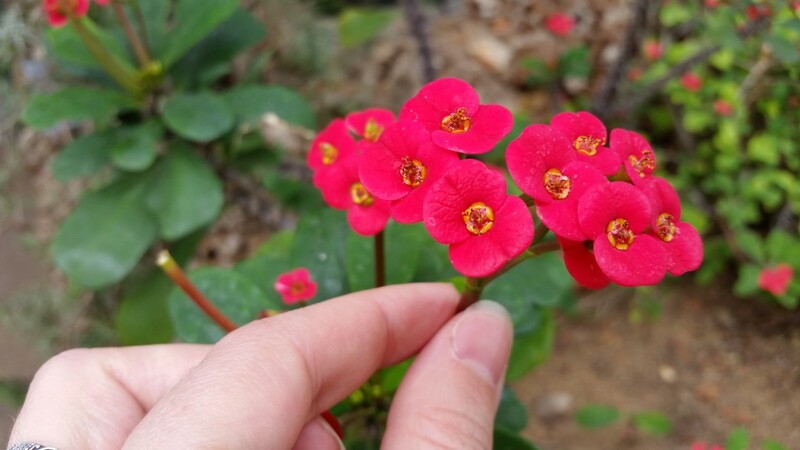 I bought a small euphorbia last year; it grows, it flowers but the leaves are turning red. Most of the leaves are now half green, half red. Do you have any idea why? Sometimes when the plant is getting tons of light, the leaves turn a bit redder. It could also be phosphorus deficiency, it causes the leaves to develop red-purple overtones (especially on the tips and outer edges of the leaves) and have a stunt growth. Try to do apply a mild diluted fertilizer, or maybe re-pot the plant to see if that fixes the problem. Let me know how it goes, or if you have any other questions!